As many of you may know, there has been quite a bit of news out there lately about the health benefits of fasting. I actually personally do it myself and have even incorporated it into how I take care of my dogs. I think we are all exposed to more toxins than ever and anything we can do to try to help prevent disease in ourselves or our pets is something worth looking more into. In case you are new to my blog, I learned the sobering statistic too late that 50% of dogs over age 10 get cancer. While cancer is always in the very back of your mind, it’s even more so after you’ve had a pet actually get it. If you are interested in that story, you can read about it here, http://savingcatsdogsandcash.com/what-i-learned-losing-a-dog-to-cancer/. Now that I have two more dogs that are over age 10, I spend more time than is probably healthy, worrying about them. From everything I’ve read, fasting is another arrow in my quiver in the fight to keep my dogs as healthy as I can. The side benefits are that it is easy and free. Before I go any further though, I want to let you know that for the most part, my dogs are all healthy. I know there are a lot of owners out there that have dogs with pretty major health issues, so for you guys, I’d recommend talking to a holistic vet first, to make sure fasting is right for your situation. If you need help locating one, here’s the link to a directory that can help you find one, https://www.ahvma.org/. While it was impossible to find any cut and dry rules about fasting, I did read that toy breed dogs are prone to hypoglycemia and dogs suffering from diabetes can also have issues with fasting. I’m sure there may be other instances, such as frail or otherwise unhealthy dogs that should probably not be subjected to fasting. If your dog falls into any of those categories, please check with a professional first. While it can be extremely beneficial, fasting can also be detrimental to those with certain health issues. I read numerous blogs and articles where mostly the same information was just regurgitated (without any source information) over and over, so finding a good solid source or sources to refer anyone to was difficult. I kept reading not to fast senior dogs, but not a single article I read, which there were many, explained why that was a bad idea. The best reason I could find was in her 2011 article titled ‘Therapeutic Fasting – This Dietary Habit of Wolves Might Be Right for Your Dog Too But Never for a Cat’, one of the top veterinarians in her field with a widely popular following, Dr. Karen Becker, mentioned that a reason she suspected fasting, which had been popular in the 90’s had fallen out of favor (at that time–2011) had been due to incidents like her own personal experiences of seeing fasting done on the “wrong type” of patients, like “a very elderly, ill Schnauzer who was already cachexic (wasting away)”. I’m guessing that all of the articles and blog posts I read that were written after Dr. Becker’s 2011 article were possibly lumping what Dr. Becker had said about that one negative experience with fasting she’d seen in an elderly dog into a generalization that all senior dogs should not fast. Other than that one mention Dr. Becker gave, I didn’t find a single article anywhere mentioning a negative reaction or outcome or even the possibility of one by fasting a senior dog. Since I couldn’t find a single reason or explanation as to why a healthy and active senior dog shouldn’t fast, and it almost makes sense to me that unless they have some serious pre-existing health condition or are frail, that they SHOULD be fasting to unload years of toxic buildup, I’ve chosen to fast my two senior dogs along with my other two younger dogs. It’s been over a year now that I’ve been intermittently fasting my dogs and I haven’t noticed any negative side effects with any of them. Unfortunately, even looking through my holistic vet books, fasting is only briefly mentioned. Both Dr. Martin Goldstein D.V.M. 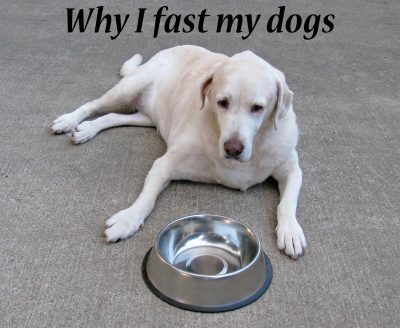 and Dr. Richard Pitcairn D.V.M., PhD., briefly discuss fasting as it relates to pets and its benefits in their books. Dr. Pitcairn references Dr. Donald Ogden, a D.V.M. (from several decades ago) who did extensive research and use of fasting. According to Dr. Pitcairn’s book, Complete Guide to Natural Health for Dogs & Cats, Dr. Ogden’s use of extended fasts helped with nine out of ten skin irritation cases. Dr. Ogden also apparently found that three to ten day fasts were very beneficial for many conditions, including obesity, rheumatism and arthritis, constipation, chronic cardiac insufficiency, bronchial diseases, heartworm, kidney and bladder stones, gastritis, kidney disease, pyorrhea, diabetes, liver disorders (unless cirrhosis has developed), open sores, and the fever stage of distemper. Dr. Ogden did, however, advise against fasting an animal with a wasting disease such as cancer, advanced uremia, tuberculosis, prolonged malnutrition, hookworm disease, or distemper. Both Dr. Goldstein and Dr. Pitcairn mentioned in their books that most of their patients were in either dire situations that didn’t make fasting a good option, or in Dr. Pitcairn’s case, he said he only occasionally used fasting, relying more on naturopathic medicine. Dr. Goldstein did admit to fasting his own cats and dogs for one-day fasts every few weeks. Keep in mind though, his book is from 1999, so that may or may not be his protocol or recommendation now. Finding any recent, credible, or consistent information about fasting dogs is difficult, to say the least. Most that do talk about it only talk about the benefit of fasting raw fed dogs. As with the recommendation to avoid fasting senior dogs, there was no reason given why only raw fed dogs were mentioned and not kibble fed dogs also. Possibly because the writers are just big supporters of raw feeding, which is great, but not helpful for those that just cannot afford to feed raw, but still want to do whatever else they can for their dog. When you think about fasting and how it works, which is the act of not eating for an extended amount of time, you can see how it would simulate what takes place in the wild. Coyotes and wolves have easily survived not eating on a regular schedule. They eat what they can when they can with sometimes very long breaks in between. Basically, over time, our dogs’ bodies get clogged up with toxins from various sources like food, water, and medications. Digesting food uses a lot of energy, requiring the body to work almost non-stop to keep up. That heavy workload doesn’t give the body a chance to get rid of those toxins that have built up or for the immune system to heal. Fasting provides the body a break from digestion and the nutrients it provides, so the body must use fat stores as energy, which in turn cause the toxins to be released and passed out of the body. Obviously, removing toxins and an improved immune system make for a healthier dog. During the fasting process, the body can work on healing itself. That’s why some animals that are sick or injured, especially those in the wild, hunker down and don’t eat. That is their instinct. While there are a few ways you can fast your dog, my current method is to skip my dogs’ morning feeding 1-2x a week. That gives their bodies 24 hours of no food. That means only water is allowed and no food of any kind, including treats, dropped food, or bully sticks. The fasting days are random and vary from week to week. The dogs have all been fine with the fasting, as they are generally much more eager for their evening meal than their morning meal, so skipping that meal once or twice a week has been noneventful. There is no whining or begging or guilt of any kind. They just sleep through what would have been mealtime that day. As always, I still monitor them to make sure they are acting ok and their bowel movements are good. Nobody has shown any negative side effects, including getting sick from lack of food for that length of time. Another fasting option I read about and seems like a pretty easy undertaking is to just feed your dog one meal per day. Due to most dogs needing to use the bathroom after eating, probably an early evening schedule of feeding would allow plenty of time for a walk and bathroom break before bed. That gives them 24 hours between meals every day, which according to everything I’ve read, is fine for most dogs. I actually used to only feed my dogs once per day, but somewhere along the way I read two smaller meals were better, and apparently, it made sense, so I started feeding them that way. Now that I’ve researched the benefits of fasting more, I have to wonder if I wasn’t doing better by my dogs all those years that I was only feeding them once per day, giving their bodies a long break between feedings. After all of my research on fasting, I’m definitely thinking about revisiting the subject and possibly going back to that much easier and what appears to be equally beneficial feeding schedule. If your dog is sick or even if it’s healthy, I recommend you look into seeing if fasting is right for you. There really are only benefits to be had from it and unfortunately, vets, with their limited education on food to begin with, don’t make money on healthy pets, so you’ll more than likely have to look to a holistic vet or do your own digging to get honest and accurate advice to determine if it’s right for you and your dog. If completely fasting isn’t right for you or your dog, you might also consider a restricted calorie diet, that has also been proven to provide many health benefits. Dr. Becker discusses it a bit in her article below (See #2). If you want to dig deeper into the nuts and bolts of fasting, I’ve picked out the articles I found the most helpful. Does anyone else fast their dogs? If so, I’d love to hear your story (when did you start, how long have you been fasting, etc.) in the comment section below. To receive notifications about my future posts, be sure to sign up for my newsletter. My two current German Shepherds that are going to be 3 fast themselves. When we had two other ones with them when we first got them, everyone ate at a specific time and two meals a day. But when the two males passed (April 2017 Apache with foot cancer and he was almost 9 and Moose in May 2017 from old age-they think he was 14), they stopped eating regular meals. I thought it was because of grieving but altho I continue to put out food (I feed raw) twice a day, they sometimes only eat one meal a day and sometimes none. They both are very healthy non-vaccinated( besides for rabies which is the law unfortunately) non-spayed female sisters. Like you I worry all the time mostly because I want them to live long healthy lives. Oh Chris, I’m so sorry to hear about your back-to-back losses! And to cancer at only 9. Grrrr. What an awful, unfair disease cancer is! I felt like feeding Abby, my lab raw would help us avoid cancer, given her other issues, but then I read about how a big raw feeding advocate and sole raw feeder had a dog get cancer, so now I just don’t feel safe at all anymore. That’s why I’ve added raw feeding, the silver, fasting, supplements, etc., to the mix. One thing my dogs do have going for them is absolutely no shots of any kind, plenty of exercise, lots of sunshine and fresh air, and a stress-free environment. To not completely crazy myself out worrying about it, I just try to remember that we’re all going to die of something and probably not peacefully in our sleep. I had 13.5, 14.5, and 13 good years with my previous seniors, so I really can’t complain, but it is much more stressful with my older girls now than it ever was with the others having lost one to cancer and learning how common it is. Your dogs’ fasting is interesting and not the first I read about some dogs doing that. Unfortunately, for whatever reason, possibly due to their history before coming to me, not a single one of my dogs will walk away from a bowl of food. Since that is our case, I have to intervene and do what I’m hoping is the best for them.